Holiday pet safety is critical for households with pets. 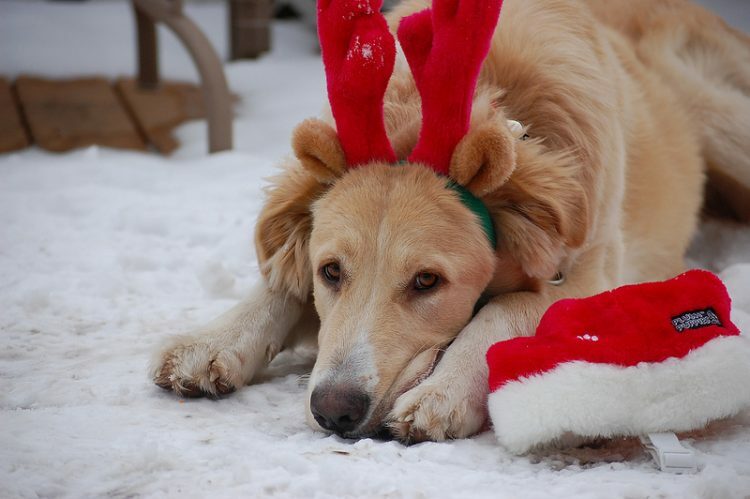 Read our expert guide to keeping your dogs, cats and other animals safe this holiday season. The holidays are always full of fun, families, friends, food and furry friends trying to get into as much trouble as possible. 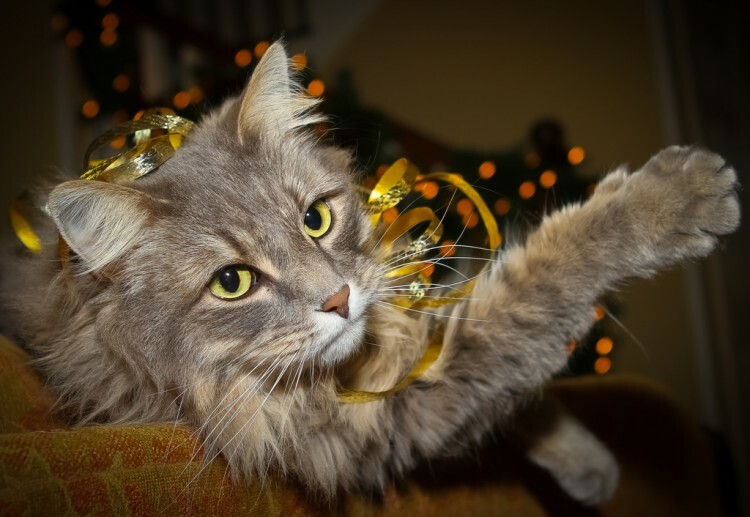 Holiday pet safety is critical, so in this article you’ll find plenty of safety tips. No matter how many times people read these warnings, we still see a load of holiday-related emergencies that could have been avoided with more careful monitoring by pet parents. Holidays center around what? Food. Thanksgiving may be the busiest 24 hours your kitchen sees all year. Fat, skin, bones, giblets or just too much turkey meat are all dangerous for pets. Maybe your pet can tolerate a tiny amount of plain, white meat turkey, but even that might be too much if your pet is not used to table scraps. And watch the turkey string you used to keep that stuffing inside the bird or to lift the bird out of the pan, particularly with cats who love to play with string. Cats are highly prone to swallowing string, resulting in intestinal obstruction. Stuffing usually includes garlic and onion, both potentially toxic to pets. Onions, chives and garlic can cause GI irritation and possibly red blood cell damage, particularly in cats. Maybe your grandmother’s recipe included some sausage? Cranberries? Any one or combination of these ingredients can cause stomach upset — or, worse, can actually be toxic. A dropped dollop of stuffing will probably cause no harm, but some pets are being fed things all day long: a little onion there, some garlic here. Toxicity potential increases with the amount of the offending food consumed. Fatty, buttery, creamy, sweet foods like these can cause extreme GI upset. And GI upset can lead to a mild to serious case of pancreatitis — a painful condition that is more prevalent in small dog breeds and cats. Don’t scrape dinner plates with all these goodies into your pet’s bowl. Raw dough contains yeast and is dangerous to your pet. The yeast converts sugars to carbon dioxide gas and alcohol. The result? A bloated, drunken, very sick pet. Typically, a pet finds raw dough left out to rise and snatches it, so be careful while making breads and pastries. Dough toxicity requires a vet emergency visit. Many holiday dishes — salads, breads, fruitcakes — contain just a few grapes or raisins. We don’t understand why grapes and raisins cause kidney failure, but they can. Any grapes or raisins are potentially toxic and require emergency treatment. Many products — candy, gums, baked goods — contain xylitol, a sweetener toxic to pets. Xylitol causes insulin release, which leads to hypoglycemia (low blood sugar). Signs can begin with vomiting, lethargy, in-coordination, leading to seizures. Xylitol can damage the liver, and liver failure is possible within a few days. The signs of chocolate toxicity are wide-ranging, from a little hyperactivity to GI signs to tremors, seizures and death in cases of extreme chocolate ingestion. The darker the chocolate, the more serious the possible toxicity. Baker’s chocolate is extremely dangerous. Always make sure your baker’s chocolate bars are far away from pets. Yes, these are potentially toxic, and the source is usually marijuana left on a low table, outside on the patio or in a bedroom — or pot brownies. Don’t be embarrassed as the party host to ask your guests to lock up their stash. 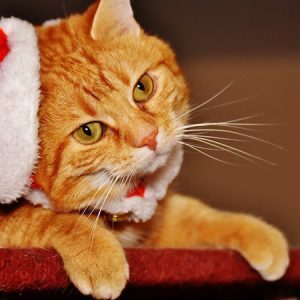 So can you give your pets any food during the holidays? A few table scraps or healthy human food items are fine in everyday life, but Thanksgiving “scraps” are rich, sweet or fatty. Holiday scraps are too different from what you usually share with your pet — and it’s often just too much food. 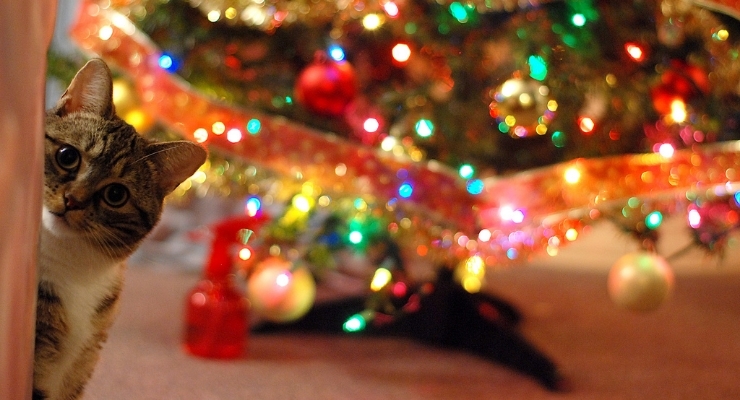 Some careful and calm advance planning can ensure holiday pet safety. Visitors, flashing lights, strange smells, and guests constantly arriving and departing can be difficult for a pet to understand. All of a sudden, a quiet household is turned on its head. The home even looks different draped in tinsel, decorations and lights. The house is your pet’s core territory. Changing the way it looks, sounds and smells may unsettle pets. 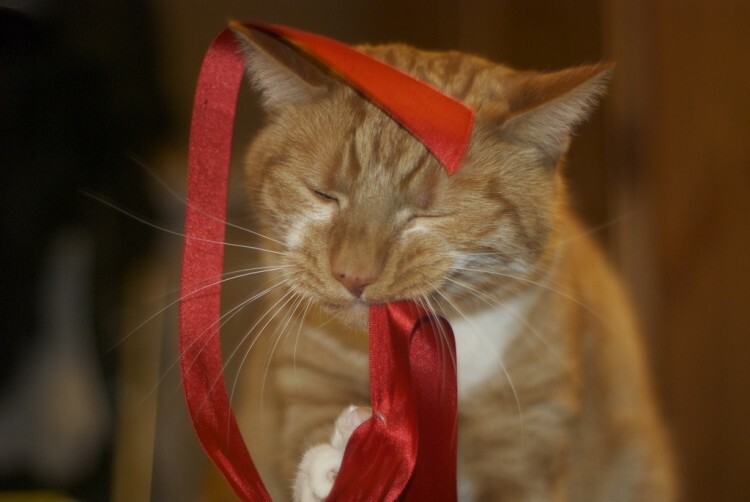 Putting decorations and presents out of the pet’s reach, which decreases the risk of chew hazards. Give your pet a place to retreat to, away from the madness. A crate is ideal — the dog can remove themselves to a safe place when the festivities ramp up. But don’t go overboard decorating the crate. This is the dog’s space, not yours. 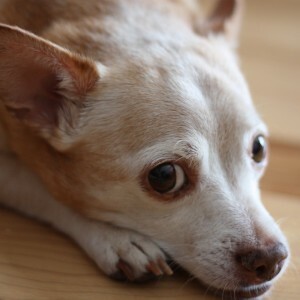 Think about how your pet copes with guests. If necessary, set a room aside for the dog or cat to hunker down until the festivities are over. You know your pets better than anyone. If your cat hates change or commotion, give them a safe area, a sanctuary away from holiday commotion. They will be happier and will not suffer from a lack of human contact for several hours. Give your cat food, water and litter in their safety lair, and they will be less stressed than if they are trapped under a coffee table with a toddler or stepped on while trying to traverse their way to their litter box. 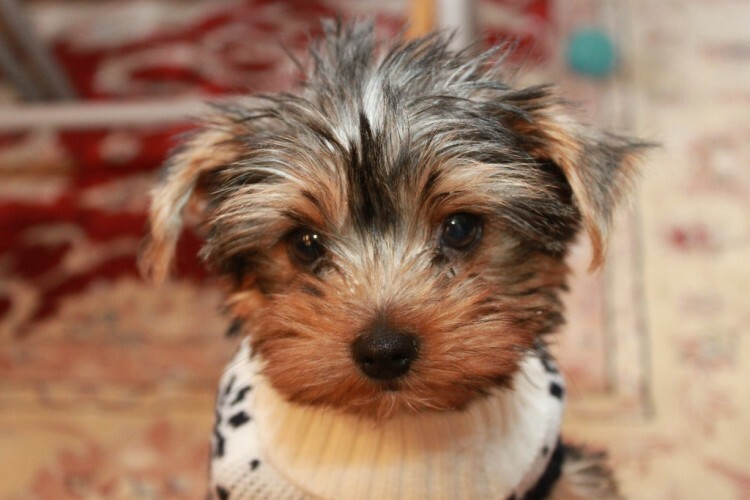 What you do with your dog will depend on their personality. You may not have to do anything with your Golden Retriever who loves to sit and make googly eyes at each and every guest, but what about your high-strung terrier who uses your guests as a trampoline, or your Beagle who bays at them until they give the Beagle food? Have a safe place where your behaviorally challenged dog can rest and not bother or be bothered by guests. Those festive, flashing fairy lights need power, which means extra cords and wires trailing around the house. All it takes is one inquisitive pup who decides to investigate with their teeth, and you’re heading for a trip to the veterinarian. Be sure to hide all cords out of the way or protect them with chew-proof covering. If your pet does bite through one, protect yourself by turning off the power supply before you rescue the pet. 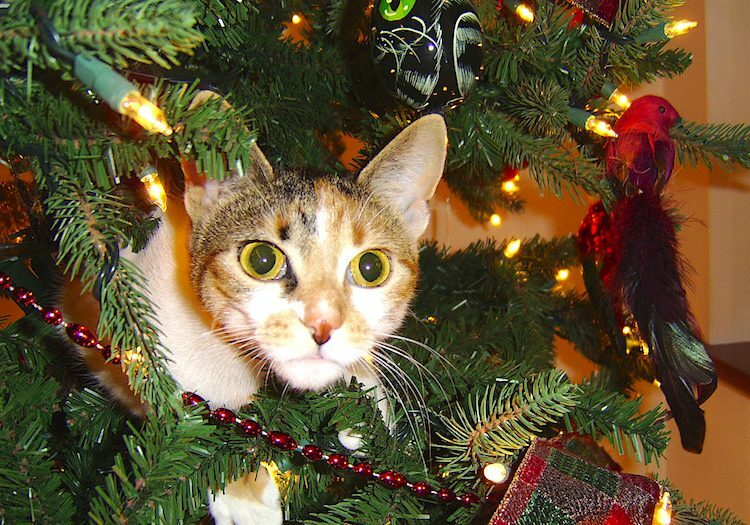 If your Christmas tree gets knocked over by a climbing cat or an inquisitive dog, you’ll end up with a smashing-bad time. 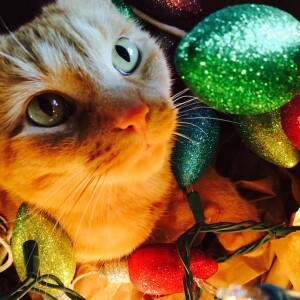 Broken glass and pets’ paws don’t mix, so opt for shatterproof plastic decorations. Be careful of any open flame or hot oils, toxic essential oils or potpourri — and, of course, fireplaces or wood stoves. Again, holidays are not like a normal day. On a normal evening, you are probably relaxing, monitoring your candles or wood stove carefully. On a holiday, however, you’re cooking and entertaining. This is just common-sense holiday pet safety, but be sure to monitor open doors and windows. Even in colder climates, many houses get overheated on holidays. Ovens roasting for hours, the fireplace roaring for ambience on a warm day, and lots of people in a crowded house can cause the temperature to climb. Someone might just open a window or prop open a door, and the indoor cat escapes or the dog runs out the front door. Guests may bring food gifts, candy or a dish for your table. Make sure these are out of pets’ reach. Likewise, don’t leave nibbles like nuts or candy on low tables. Designate a family member as a busboy to help you clean up after guests who have left shrimp tails and cocktail sauce and other leftovers on an end table. Keep all foods in all stages of preparation away from your pet. You may have decorated with flowers or plants, or guests may have brought you a bouquet or table arrangement. Keep these on higher surfaces. Toxicity from chewing on toxic flowers and plants is often limited to gastric upset, but some plants are truly toxic. Every holiday season, vets get phone calls from worried people who found their dog or cat chewing on some holiday greenery. Most of these ingestions don’t result in much more than a bedraggled-looking Christmas plant, but you should be aware of potential toxicities. First thing to do to avoid a potential poisoning? Make all attempts to keep the plants out of reach of pets from the get-go. If your get an amaryllis as a present, it will most likely be a bulb in a box, and your pet may not be tempted or able to open the box to get to the bulb. But if you have been growing amaryllis bulbs for a few months to have them flower at Christmas or receive a flowering amaryllis plant, the danger to your pet is more real. Alkaloids in the bulb and the leaves can cause vomiting if ingested. Most pets chew on the leaves, which cause mild gastrointestinal upset such as vomiting, diarrhea, loss of appetite or hyper-salivation. Symptoms can be more extreme if your pet ingests part of the bulb, including restlessness, tremors or trouble breathing. These severe cases should be brought to an emergency veterinarian. Mild GI signs are seen most often, and these usually resolve on their own in a few hours. Many people panic about poinsettia ingestion, but this plant is actually not that dangerous. The hysteria stems from a wrongful 1919 report of a 2-year-old child in Hawaii dying after eating poinsettia leaves. The child died of other causes. The urban myth lives on. Although a pet chewing on a poinsettia may create mild vomiting and/or diarrhea signs, the more common toxicity is caused by the sap in the leaves. The pet’s skin can become red and itchy if in contact with the sap. 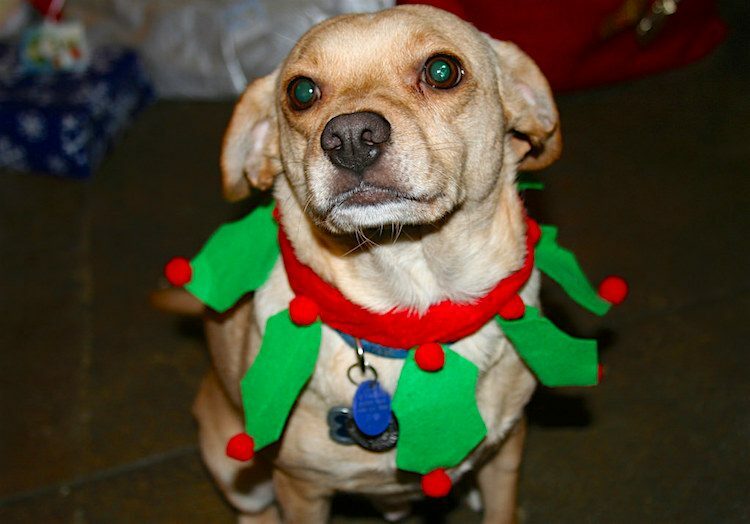 Ingestion of poinsettia sap by pets can irritate the mouth and cause excessive salivation. Eyes may become irritated if the pet gets the sap in them. Bathe your pet with mild soap and flush eyes with saline or water. You can also give milk to coat the GI tract and mouth. The vast majority of these exposures are self-limiting. Once again, GI signs are the most common symptom if your pet chews on the beautiful blooming Christmas cactus. If a lot of the plant is ingested, there may be bloody vomiting and diarrhea. 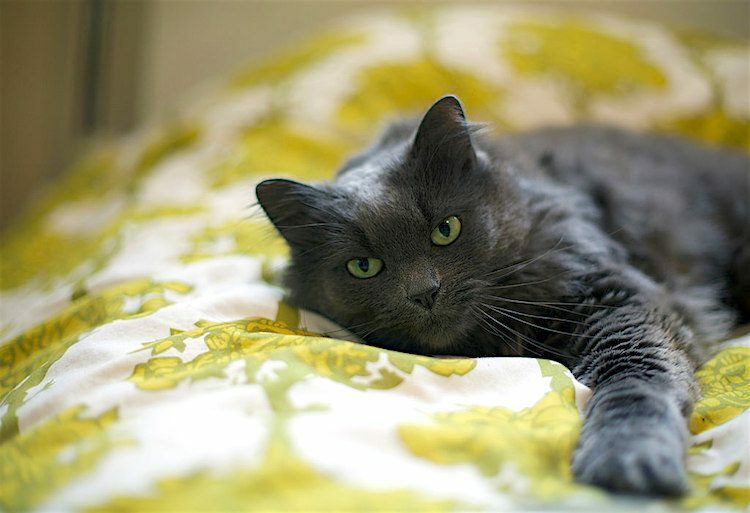 Cats can become mildly neurologic and stagger (ataxia). Most pets get better in a few hours. This is a beautiful little houseplant that has become popular at Christmas. Kalanchoes are cardiotoxic plants (dangerous to the heart) if ingested. Thankfully, the dwarf variety cultivated for houseplants are less toxic. The flowers of these plants are the most toxic. Ingestion usually causes GI signs and, rarely, cardiovascular signs. If your pet seems weak, disoriented, vocalizes in a strange way or acts extremely depressed, this requires emergency treatment. Often found as decorations on wreaths or in winter arrangements, holly also grows outside as ornamental shrubs, and people may bring holly into the home for decoration. Ingestion of holly by a pet can cause GI upset, but eating holly also poses a mechanical problem: The leaves are sharp and can cause irritation in the mouth and, if enough is ingested, can act as a foreign body in the GI tract. The same goes for your Christmas tree: Eating needles and nibbling on branches can cause mechanical irritation and blockage. Watch for signs of stomach upset, anorexia and abdominal pain. Feeding some bread may help to mix with the holly to pass. Holly is not particularly pleasant to eat or tasty, so most pets don’t eat enough of it to cause a problem. Little rosemary trees with a ribbon on top make a lovely gift and can be attractive to your pet. But rosemary contains essential oils that can be dangerous to pets. In small quantities, there is no problem — eating a lot causes irritation to the GI tract. Large amounts can cause kidney damage and low blood pressure. If you know your pet ate a lot of rosemary and has severe vomiting or diarrhea, go to the emergency hospital because damage to the kidneys may occur. Food tempting us all over the place. Relatives sleeping on our beds and couches. Ornaments and tinsel to chew on. With all the stuff we pets can do to ourselves, it’s a holiday nightmare out there. What humans do: Bake flourless chocolate cake with cocoa and dark chocolate. Get distracted and leave the cocoa and the chocolate on the kitchen table. What we pets do: Eat it and promptly ruin your holiday (and your bank account) by trying to commit death by chocolate. We are constantly watching and waiting, drooling alongside your culinary endeavors. As soon as you run to turn on the Christmas lights, we have helped you clean up all your baked goods, raisins and anything else that can harm us. 2. Don’t leave holiday treats out to tempt us. What humans do: Let all the relatives leave food all over the place. What we pets do: Sneak around and score big time when humans aren’t looking. Guests bringing tidings of comfort food are a hazard. Say hi to Aunt Sophie, but take the candy box or the fruitcake away from her as soon as she walks in the door and put it in the closet. Your guests can be slobs. We love it when they leave half-eaten plates on low tables or the top of the trash can open. Bones to swallow! Grapes to poison us! Nuts and shrimp tails and so much more to cause digestive disasters! 3. Put the wrappings, ribbons and presents away. What humans do: Wrap presents deep into the night and get tired and go to bed. What we pets do (especially cats): Find the ribbons on the dining room table and eat them and get a string obstruction in our intestines. 4. If you must leave us this holiday season, put us with the right humans. What humans do: Leave home for the holidays and hire a pet sitter or put us in a kennel without doing their research. What we pets do: Get stressed or scared or stop eating or just depressed. And we cats stop using our litter box. Not all people share your love of pets — shocking, we know. You might think your friends and family feel exactly the way you do about the mound of cats sleeping on the bed or that parrot throwing food around the kitchen. This is not the case. It’s your job to prepare your guests for your pets and to ensure holiday pet safety. Try a diplomatic tactic, and say you are calling to be reminded of any food issues your guest might have. Then expertly shift the conversation toward your pets. If you don’t have perfectly behaved pets, instruct your guests on how to live in a pet house. For a big party lasting a few hours, you might consider keeping your pets in a safe place away from guests. Explain to relatives who say they are allergic to pets that no amount of cleaning will make your home allergen-free. They should prepare by remembering to bring allergy medicine, etc. Ask your guests not to bring their own pets or only pre-approved pets. If pets must come, try to figure out in advance if you have room to keep that pet safe as well as your own. Ask your guests not to feed your pets without asking. Unfortunately, veterinarians get lots of emergency calls about pets who have been overfed by well-meaning visitors. Kindly explain to family and friends that you and only you control the feeding of the pets. No feeding from plates or licking of dishes. Toddlers, in particular, are notorious for their “trails of turkey.” They are the Marie Antoinettes of the pet world. “Let them eat cake!” the tiny tots are screaming, as they run through your house throwing tidbits to the peasant dogs. Older kids can find it funny to feed pets weird things. It’s not funny. Tell the young adults that snacks are off limits for the pets. Ask guests to monitor their children. Or to keep your pets physically away from kids and babies if you have any concerns about their parenting skills, common sense or the behavior of your pets. No visiting kid is ever 100% safe around a pet. Even perfectly loving and gentle pets can scratch, lunge, frighten or bite a kid if they are not used to little people. It’s best to talk upon arrival to those guests bringing kids, and discuss a plan for child-pet supervision. If these delicate conversations can take place ahead of time, it can save hard feelings or resentments. Some people believe children’s needs always trump those of pets. If little Annabelle is afraid of Snoopy or if Tim the 2-year-old terror likes to play “rough” with your terrier, many parents believe the pets should be “put away” while the children are visiting. While child safety is paramount, it may be difficult or not to your liking to confine your pets for several days. Ask guests to be aware of doors and pet escape routes. If you have an indoor cat, for instance, and people will be running in and out to your backyard football game or fire pit, lock the cat away in a safe place. Same goes for dogs if you don’t have a fenced backyard. As far as the front door goes, guests will understand if you keep it locked. Doors tend to stay open longer than usual as a family arrives and the meet and greet goes on for more than a minute or so. Pro tip: Designate a “doorman” to usher the guests in and close the door. Ask guests to keep their purses and bags off the floor or low-lying surfaces. Personal items like medications or xylitol-containing candy and gum are dangerous to pets. Dogs love to poke their noses into bags — and cats love to knock pill vials or other snack items off bedside tables so your dog can eat them. Ask guests to be careful with the garbage. They shouldn’t keep trash receptacles uncovered — or try to “help” by taking the trash out and leaving a plastic bag on the back porch. 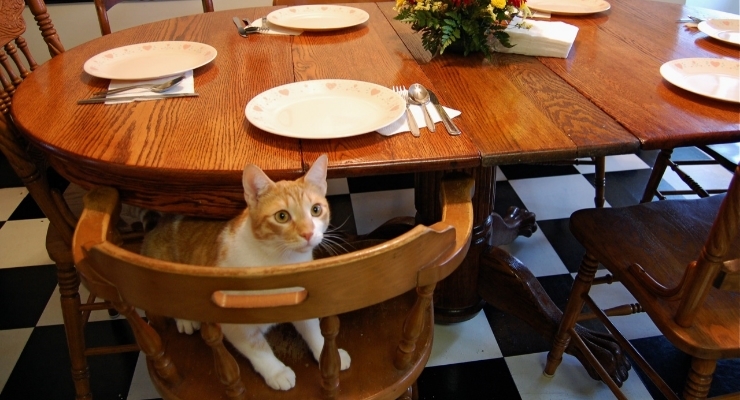 Ask guests not to disturb pets who are in their private space. Don’t let children play in the pet’s bed or crate at any time. Keep guest rooms off limits to pets, if possible. Unfortunately, some pets think the guest bed is their bed and may guard it. So shut off guest rooms to pets, if possible. Company might leave their medications where a pet can get them or have food in open suitcases. Your dog might recognize a shoe as “foreign” and chew it, or your cat might mark (urinate) on a strange pile of clothing. 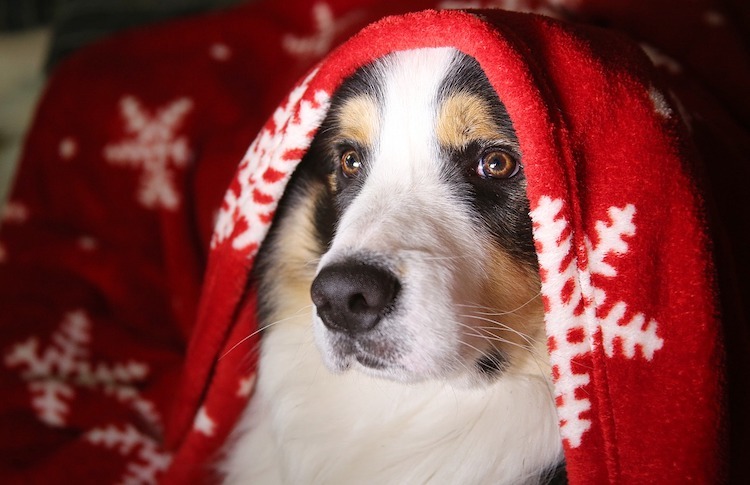 Let’s face it: The holidays are stressful for you, your guests and your pets. Safety is the big message here. Many pitfalls can be avoided by being more mindful of common hazards, but accidents are going to happen. Yes, following all those holiday pet safety tips above is hard work. But in honor of this season, let’s all take a moment and be thankful for those unique and loving creatures who give us unconditional love every day: our pets. Our pets are thankful for all the good care and love you give them, too. This holiday season, be sure to give your pets what they crave: security, routine, continuity and attention. And when your guests are gone, you can give thanks that your relatives don’t live with you, and snuggle up with your favorite family members: the fuzzy ones. November is a thankfulness, gratefulness, “feelgoodness” kind of month. I, for one, am grateful to be a veterinarian and honored to have had many, many animals in my home and under my care. P is for my Pets and Patients. Every day that I come home to a licking, jumping, happy, barking or meowing friend, my soul is lifted. After a day of helping ailing pets and feeling their thankfulness, I am grateful for veterinary medicine and the love animals have given me. E is for a pet’s Essence: love and affection. On any given day, world politics may upset you, a human may have treated you poorly or you’ve run into some bad luck, timing or car trouble. And then you can go home to your animals who give you unconditional love and affection. They love you if you’re cranky. They love you if you’re tired. They love you if you’re happy. They love you if you’re sad. To them, it’s not a good or a bad day. It’s your day to be with them, and they love you for it. T is for Time with our pets. Whether you’re walking with your dog on any day, rain or shine, sun or snow; snuggling up with 2 dogs and 3 cats on an old sofa; or watching your bunny dance about, your guinea pigs dive into their veggies or your bird talking to you from the other room, the time we spend with our pets is precious. They know it, and we know it. S is for the Sanity our pets bring us. Yes, sanity! If you have lost it during a difficult day, look to those fabulous animals of yours and center yourself. They give us a new perspective on life, bringing with them the calming power of joy and love. They give us so much. I really have no words to describe what our pets give to us. If you do, give them in the comments below — I’d love to read how your pets make you feel. And if you have any holiday pet safety tips that weren’t mentioned above, share those in the comments, too. 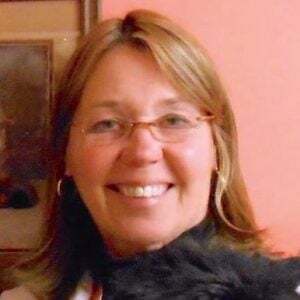 This expert guide was written by a veterinarian, Dr. Debora Lichtenberg, VMD, with contributions from Dr. Pippa Elliott, BVMS, MRCVS. It was last reviewed Nov. 20, 2018.